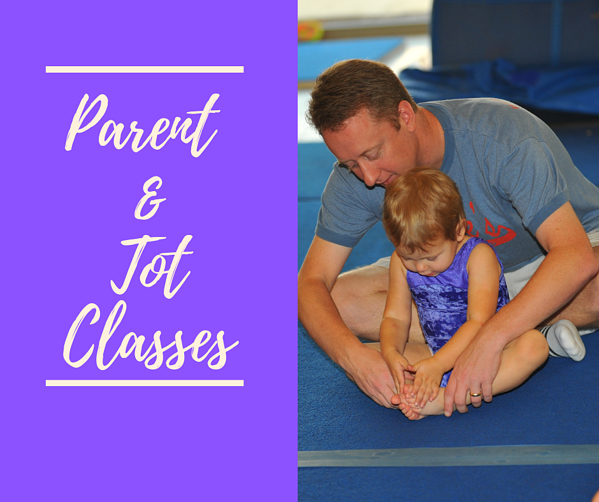 Parent tot classes are so much more than gymnastics. These classes for 18-36 month olds provide an incredible opportunity to spend quality one on one time with your toddler while introducing them to so many new concepts. The best parent and tot classes incorporate stations that help to develop fine and gross motor skills. 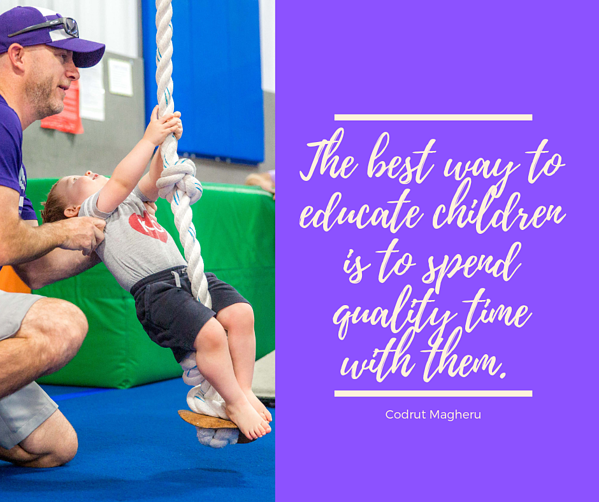 In addition, the class provides an opportunity for your toddler to practice listening and following directions, interacting with other adults and children, and learning to take take turns - important lessons needed for Preschool Gymnastics and traditional preschool. Toddlers love to act like monkeys. Swinging and hanging are so much fun of course they are better with monkey sound effects. You can swing in a tuck, pike, straddle, or with your toes on the bar. You can swing on the bars, the rings, the parallel bars, or between mats. Balance boards, exercise balls, balance beams, squishy mats, one foot, tip toes ... the options are endless. 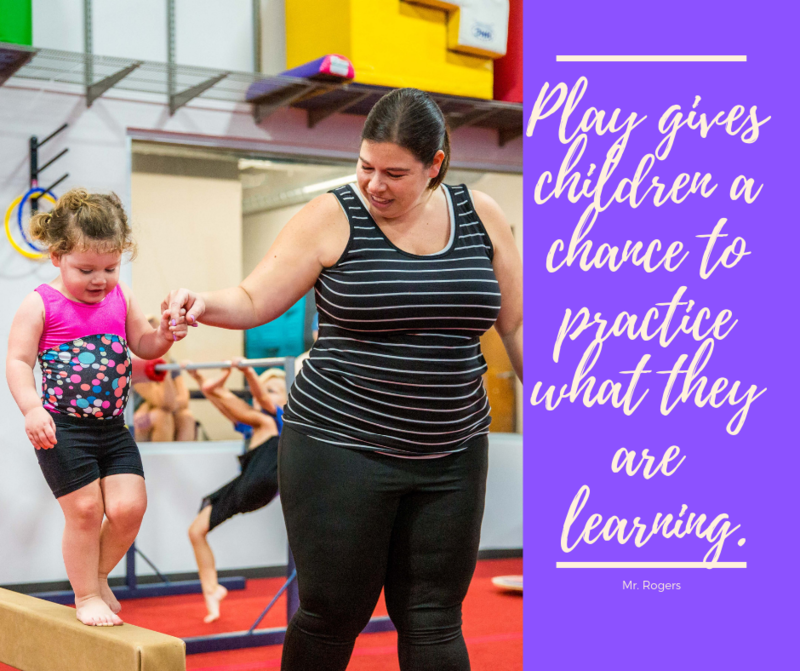 There are so many benefits of bear crawls, beyond building the arm strength necessary for future gymnastics skills (cartwheels and handstands) it is also a great tracking activity for the eyes. Tracking is a necessary skill when it comes time for reading. Don't forget two year olds love to growl like a bear! In parent tot we love to climb rollie mountains, block mountains, through tunnels, under mats, and through the pit. This is not only a great workout and guaranteed way to run out energy it also helps with playground safety. We love to jump on trampolines and on tumble tracks. However, one of my favorites is learning to jump off of a mat or block and land safely on our feet. It certainly comes in handy in life when you can perform a safe landing. I have many versions of memory that the kiddos love to play. However, we always add a twist. One match is on one side of the floor (or beam) and the other match is on the other side. The children must move (run, skip, march, jump) to find the match on the other side. We also play this game with colored hoops on one side and colored objects on the other. The children must run across the floor and put the object inside the hoop that matches. Not only are the children learning to match and sort they are also learning to separate from their adult who is on the other side of the floor. Blowing bubbles is a great way to end class. Children can jump, tip toe, and reach for the bubbles over their head. They can stomp or jump on the bubbles on the floor. They can also practice their fine motor skills by popping the bubbles with pinching fingers. Somersaults, flapjack (a backward roll drill), cartwheel hops, and handstands climbing up the wall are a few of my favorites. Mr. Potato head, puzzles, and stacking are a few of our class favorites. They seem to be even better on the beam. Pulling Velcro a part, squeezing water out of a sponge, and clipping clothespins are all great fine motor activities to develop grip strength for bars (and handwriting too). There are so many fun and creative ways for toddlers to build strength. Riding on a towel builds core strength, pushing a scooter builds arm and leg strength, lying on your back and lifting a foam noodle over your head develops the core. The stations for fun strength are endless. It may have to be a topic of its own someday soon. The options in Parent Tot classes are endless! Try practicing a few of these concepts at home. Your child is sure to have a great time and learn at the same time!